Heat coals or gas grill for direct heat. If fish fillets are large, cut into 6 serving pieces. Place fish in heavy-duty aluminum foil bag. Mix olives, capers, tomato, onions and garlic; spoon over fish. Drizzle with lemon juice. Sprinkle with salt and pepper. Double-fold open end of bag. 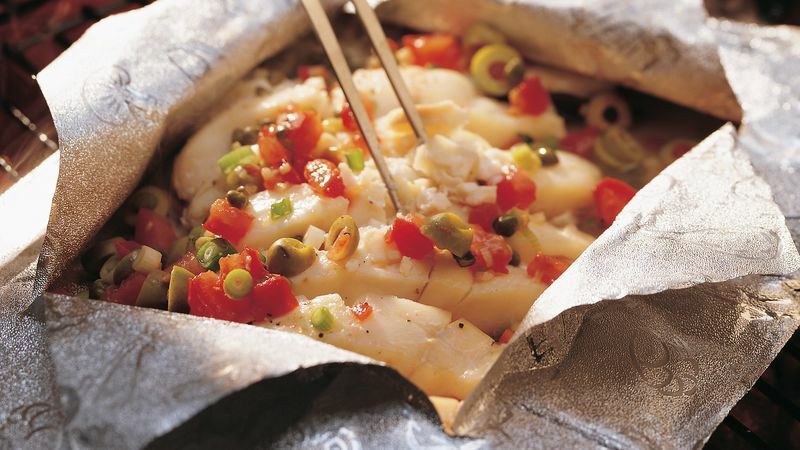 Cover and grill bag 5 to 6 inches from medium heat about 15 minutes or until fish flakes easily with fork. Place bag on serving plate. Cut large X across top of packet; fold back foil. Serve fish with lemon wedges. If halibut is not available, use cod or red snapper. To test fish for doneness, place a fork in the thickest part and gently twist. The fish will flake easily when done. You can make your own foil packet by placing food on half of an 18x12-inch piece of heavy-duty aluminum foil. Fold other half of foil so edges meet. Seal edges, making a tight 1/2-inch fold; fold again. Allow space on sides for heat circulation and expansion.